Excitement is high for the concept, but is it potential or actual energy? Aundre Collins had his epiphany on a roof. Aundre Collins says his moment of revelation came last fall as he stood on the rooftop of a solar-paneled warehouse in Richmond's Iron Triangle. From that unobstructed vantage point, beyond the shimmering panels, the 26-year-old ex-convict saw the multi-billion dollar Chevron refinery's seething smokestacks set against the sprawling streets of one of America's poorest, most-violent neighborhoods. "That's what really put it into perspective for me," says the Richmond resident and father of three, who now works for Berkeley's Sunlight and Power installing solar panels on the houses of the eco-conscious. "I was diagnosed at five with chronic asthma. The refinery's right there and it just took me." The rooftop awakening came at the end of a free, nine-week construction-training course offered by a program called Richmond BUILD. Collins took the course as a last resort. A product of East Oakland, he had gone to Grambling University in Louisiana on a football scholarship. But at the end of his second year, he got into trouble. He was convicted of aggravated burglary and handed up to 45 years in prison. However, a family lawyer got the term reduced to eighteen months, and on the day after his release he was on a bus to California. Back in the East Bay with no college degree and a criminal record, Collins spent the next few years struggling to find work. "It was hard," he recalled. "My record was getting me shot down one job opportunity after another." During the first seven weeks of Richmond BUILD's training program, Collins learned basic construction skills and took a liking to carpentry. The region's refineries seemed to offer the best prospects for entry-level trade positions. If a job opened up, working for Chevron, practically in his backyard, seemed like a no-brainer. "I'd been preached union, union, union. Whoever called me first — Chevron, Tesoro, BP, whatever." 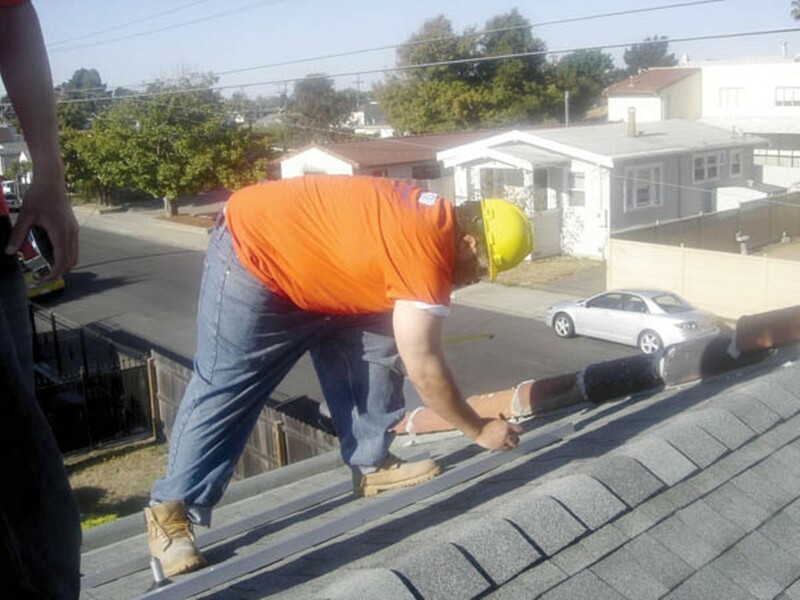 The final segment of the course was led by a small nonprofit called Solar Richmond, which provides free solar training and offers low-cost installation to city residents. It was something Collins knew nothing about and would've been fine skipping altogether. "I was just giving tree huggers their time to talk," he recalled. The training, led by the organization's volunteer executive director Michele McGeoy, was infused with the notion that green jobs not only had a positive environmental impact, but also could provide solid economic opportunity to people who really needed it. And that's when Collins had his epiphany. "I fell fully for what she was saying," said Collins, a religious man. "I'm blessed to be one of the chosen few that she allowed to be a part of this." Two months after the course ended, and armed with only a couple weeks of solar training, Collins, with McGeoy's help, got a position with Sunlight and Power as a photovoltaic installer. He was the first graduate of Richmond BUILD to land an alternative energy job. He now makes around $1,200 every two weeks with full benefits. It's a modest salary, but a significant improvement over his past employment, especially the stint behind bars. "For a guy who has worked for eight cents an hour, that's a great come up," Collins said, noting that he'd likely be making more in a union job at Chevron, but wouldn't consider it, even if they offered him double. "I can go home everyday and feel happy that I'm doing something good. ... I'm from where green-collar work is going to have to begin — people who have no jobs and willing and able to do the manual labor." Collins proclaims himself the "poster boy" for the local green-collar jobs movement — an increasingly high-visibility effort to extend environmentally sustainable work opportunities to urban young adults of color who haven't succeeded in the conventional economy. With the help of billions in private investment and local and state government incentives, the alternative energy industry, and solar in particular, has exploded in California, resulting in thousands of new jobs in panel installation and solar cell production. In 2007 alone, as the traditional economy slipped toward recession, there was a 40 percent increase in revenue for solar, wind, biofuels and fuel cells, topping $77 billion, according to Clean Edge, a research firm studying the clean energy industry. The Bay Area is home to more than 30 percent of the approximately 800 solar firms in California, according to a recent industry workforce study through California Community Colleges, which found that 75 percent of employers have difficulty finding entry-level workers and that a majority support vocational training programs. In response, nonprofit vocational training programs like Solar Richmond and Berkeley's Rising Sun Energy Center have sprouted in urban areas around the country, eager to see the work and wealth trickle down the class ladder. Among the most visible groups, and one that deserves much of the credit for the national buzz about green-collar jobs, is Oakland's non-profit Ella Baker Center. Van Jones founded the organization in 1996 to offer violence and imprisonment alternatives to urban communities. Long a rising star among black leaders and social-justice activists, Jones only recently entered the vastly white, middle-class arena of environmentalism. When he began preaching the green-collar jobs gospel in 2005, he hit the PR jackpot. Jones advocates a "third-wave" environmentalism that goes beyond traditional approaches of regulation and conservation — harnessing hot green trends to invest in low-income communities. While the opportunities in many low-skill economic sectors are shrinking, the green economy is booming, which Jones' contingent has identified as the perfect way to meet people's needs by offering living-wage jobs in the industry. "A lot of environmental initiatives are not talking jobs," said Aaron Lehmer, a program manager with the Ella Baker Center, noting that low-income folks are not figured into many green campaigns. "That's starting to change. This can be an economic generator." The concept has been a media lightening rod that's landed Jones and his group in the limelight as champions of the cause. It has won them political allies among a widespread contingent of leaders on either side of the aisle and been a repeated topic in the presidential race, with both Clinton and Obama outspoken in their support of green-jobs programs. The topic was even mentioned favorably in Republican presidential debates earlier this year. In collaboration with the energy coalition group Oakland Apollo Alliance, the Ella Baker Center drafted the details of the much-anticipated Oakland Green Jobs Corps program, which it hopes to launch this fall. It will be funded by $250,000 from the city's share of settlement money related to the California energy crisis, of which more than $2 million is expressly earmarked for energy-efficiency projects. The Ella Baker Center won't actually be running the show once an already-established workforce training program is selected in May to manage the project. The show is expected to be up and running by this summer. Intended to provide "green pathways out of poverty" to young adults in Oakland who face any number of employment barriers, the program hopes to take on forty participants, ages eighteen to 35. A three-month soft-skills training course will focus on everything from remedial education and job readiness skills to basic environmental concepts. For their hard-skills training, participants will then be placed in six-month paid internships with employers from a council of local green businesses. Ten companies, Sunlight and Power included, showed up for the first meeting in March. With the flagship Oakland program still in the works, last year Jones also took his cause to a national level, launching Green for All. The Washington-based group, comprising some of the rising stars of urban environmentalism, was created to build coalitions between labor unions, business, and community groups while urging policy makers, locally and nationally, to invest in green-collar job programs. Among the politicians paying attention was House Speaker Nancy Pelosi, who introduced the Green Jobs Act. Signed into law last December, the legislation authorizes $125 million annually to develop training programs in a range of green industries, including $25 million toward living-wage job creation in low-income communities. Lehmer is optimistic the funding will come through by next year. Meanwhile in Sacramento, Jones and a coalition of labor and environmental groups are working with Assembly Speaker Fabian Núñez and Senator Darrell Steinberg on state green-collar jobs bills that would help grow the renewable energy and clean technology sectors, while investing in job training for at-risk youth. There also is talk of offering certification courses in community colleges throughout the state.